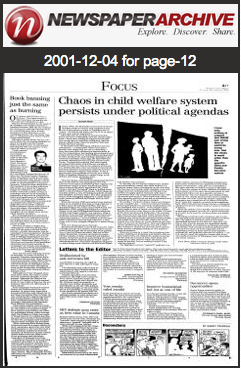 When someone as insightful and experienced as Winnipeg’s Keith Black*** speaks on Manitoba’s beleaguered child-welfare (CFS) system, why is it nobody with the power to change it appears to be listening? Black’s article today speaks for itself, and I encourage all to read it closely. Its pessimistic tone is perhaps justified coming from someone of his background: a veteran social worker and community leader who believes there’s a better way to do things — or at least, he says, if there’s a will, there’s a way. The problem, Black pretty plainly states, is the will only exists to ‘fix’ CFS to the point that it won’t cost political points in a future election. He’s careful to note that this isn’t an NDP issue, but instead one that afflicts the political system as a whole. The MASW, according to FP reporter Wally Dennison, had echoed virtually the same issues in its brief to a minister of the minority NDP government, headed by Ed Schreyer at the time. 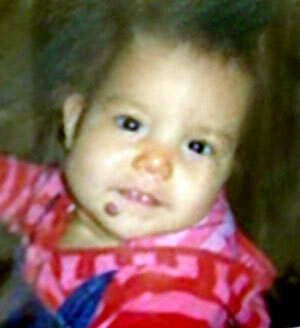 It was also calling for standards of child welfare to be set, as it appears there were virtually none in place. It’s curious because a lack of inter-agency co-operation and failure and inability to adhere to standards are very much live issues in the investigations into the Phoenix Sinclair case (2000-2006) and in the Jaylene Redhead case (2007-2009), decades after the MASW’s warning. 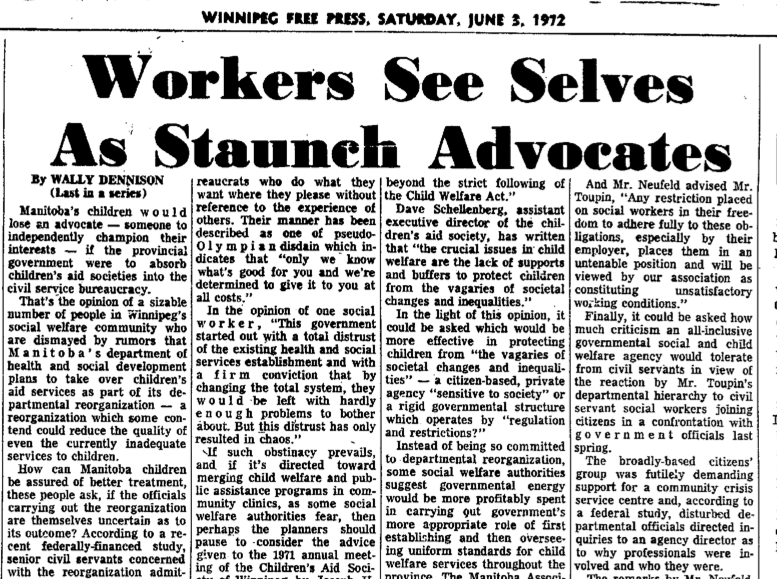 Less than a year later, in 1972, another Dennison article speaks to the government’s plans for CFS: namely, taking over the responsibility for child welfare and doing away with the Children’s Aid Society for good. The reaction to this from workers appeared extremely negative, for a number of reasons. Which brings me to my first point: It may be impossible to ‘fix’ anything about CFS if politics is allowed to trump solid and intelligent policy to fuel its actions. Sadly, we see evidence of this happening often in Manitoba. Political/ideological interference in essential services, be they policing, corrections, education or child-welfare/family services prevents solid, evidence-based policy from being the starting point from which services flow. While I’m not an advocate of privatization of the CFS system, I do believe there has to be a way to ‘divorce’ such services from the whims of government and insulate them from short-term tinkering [if not complete overhauls]. Critics of devolution – which at root is a well-meaning scheme to create greater fairness and client buy-in in the CFS system — will be first in line to hammer the government based on the above. The real criticism I have of it is how it appears it was rammed into place come hell or high water regardless of the internal chaos and confusion the new policy and its practicalities created. Anyhow. I want to come back to where we started off: When Keith Black speaks, why don’t we seem to listen? About 18 months after Phoenix Sinclair was born and not long after the NDP again took power, Black again penned an op-ed for the Winnipeg Free Press. 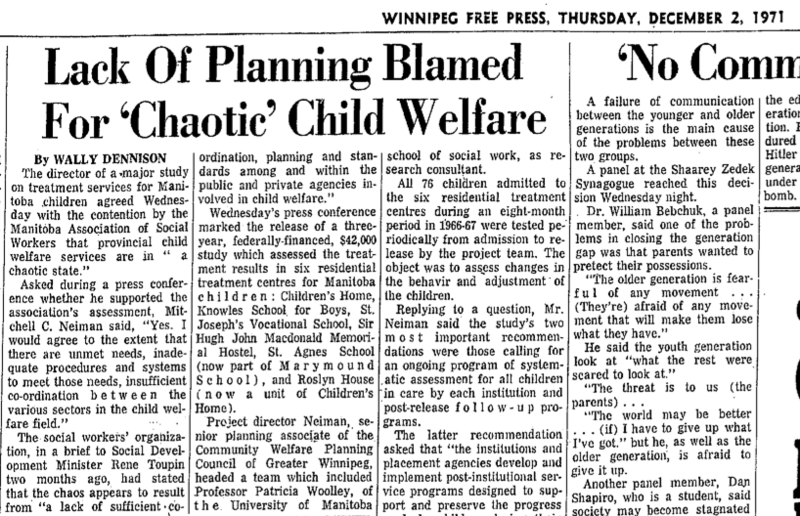 “IN the 1960s, the Manitoba Association of Social Workers wrote an article that suggested that the child welfare system in Winnipeg was in “chaos.” All hell broke loose, and there were angry denials and counter-arguments. After 40 years of working in and around children’s services in Winnipeg, until my recent retirement, I have seen nothing to suggest that MASW was wrong then or would be wrong now. And the chaos is much wider than the specific Child and Family Services system. … For decades the structural debates have hidden the real problem; namely that child welfare is a political rather than a therapeutic or service issue. The increase in training, understanding, even technology has been implemented, and the poor line workers struggle against immense odds just to understand their role and get through the day without anyone getting hurt. The people with whom other agencies and forces are not co-operating have doomed any of the structures to failure. It’s curious to me how much of what he had to say 12 years ago mirrors nearly exactly what he told us again today. I wish, as I’m sure he does, that we had listened or would at least begin to. Because it appears nearly half a century has passed and a very real problem we have to tackle hasn’t gone away, maybe even isn’t seen as worth dealing with, when really, it’s fundamental. Keith Black, BA, BSW, MSW (Class of 1960), will receive an Honorary Doctor of Laws. Over a career spanning more than 40 years, Black was a social worker at the Children’s Aid Society, Executive Director of Knowles School for Boys, and Director of the Child Guidance Clinic of Winnipeg. He was a valued member of The University of Winnipeg Board of Regents for 13 years and served as chair from 1996-98.